Directions: Take Highway 7 South to Highway 290; turn east and go 2.7 miles. The cemetery is on the left just past Mount Carmel Creek bridge. It is very hard to see as it is down a hill from the highway. 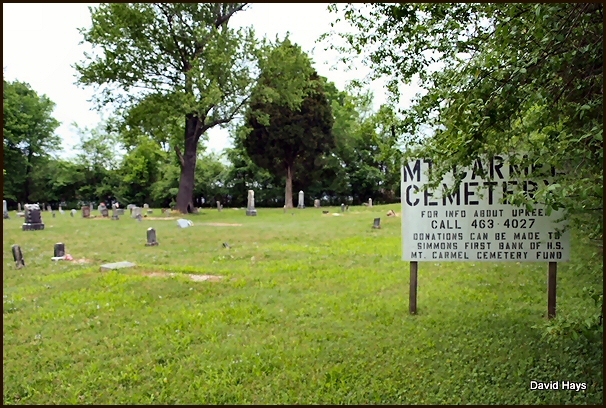 The cemetery is in a rural area and has many unmarked graves. It is well kept and still has active burials. The following report was compiled by Caroline Seiz Campbell from gravestones/markers and typed by Patti Vance Hays. Most, if not all, the tombstones may be found on findagrave.com. Thornton, Guss Nov. 19, 1888 Oct. 18, 1907 Son of R. R. and A. E.
This listing was compiled by family records maintained by Betty Parker Martin and from other sources and typed by Patti Vance Hays. Clark, Mark Dec. 22, 1896 June 27, 1921 Hot Springs Monument Co.
Davis, Ermer March 15, 1915 Dec. 30, 1916 Hot Springs Monument Co.
Owens, Ben L. June 9, 1875 July 8, 1945 Hot Springs Monument Co.
Owens, Minnie Jan. 1, 1874 May 22, 1942 Hot Springs Monument Co.
Sherrell, Eva Cortez Nov. 15, 1898 July 1, 1921 Hot Springs Monument Co.
Sherrell, Infant June 18, 1921 July 12, 1921 Hot Springs Monument Co.